Not long later, the U.S. State Department announced that it expects all foreign countries to reduce their imports of Iranian oil to zero by November this year. However, after seeing how this would effect oil prices, it announced that waivers would be issued to several allies. The first batch of economic sanctions have not yet come into force (they are due to come into effect next week), but already the Iranian economy is suffering. Because of the accelerated crisis, analysts are finding it difficult to predict when peaks will happen. Regime officials are directly responsible for the crisis, yet they are trying to pin the blame on the others. One official blamed the United States for “shamefully” claiming to have the interests of the Iranian people in mind. However, the people of Iran know that no foreign government is responsible for the terrible crisis. The regime has plundered the people’s wealth and the country’s revenue on terrorism and the support of proxy groups. Instead of looking after the people of Iran and trying to improve the social situation, the clerical regime has spread chaos across the region. Iranian economic expert and former adviser to the ministries of welfare and science, Hussein Raghefer, warned that there will be a “revolution of the hungry” and a “collapse of livelihood” in the country. It is clear that the only resolution to the economic problem is the fall of the Iranian regime. The regime’s destructive policies are incompatible with any kind of improvement in the situation. Furthermore, the people are aware of this and it is what they want. For almost four decades, the people of Iran have suffered under the regime. They have been told by foreign governments to hold tight for reform. The people did wait and it never happened. The Iranian regime has been left to its own devices for a long time with former U.S. administrations turning a blind eye to the Iran threat. The regime has become used to the complacency of the international community and it continues to act without being held accountable for its actions. 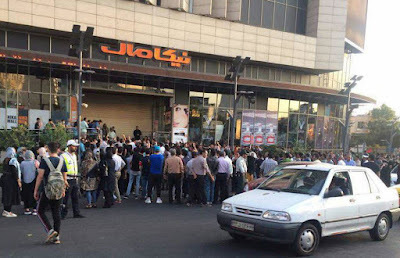 The main opposition to the Iranian regime, the National Council of Resistance of Iran (NCRI), is calling on the brave people of Iran to continue taking to the streets to call the regime out. It believes that the collapse of the government is near.